I reckon I’ve travelled around the sun a fair few more times than many Access Project tutors: I’ve hung more years on the line. When I have been thinking about what I try to bring to the Access Project, as a mature tutor, I think of a graph. One axis represents the continuum of time: the other represents the topics and activities in which I have an interest. Time, as it passes, confers experience: involvement in activities and areas of interest also brings experience. I do not necessarily equate experience with wisdom, but it does, inevitably, bring learning. I have been fortunate to have had a varied career that has led me through managing people via team leadership in a business environment to mentoring graduate trainees and developing and delivering course material for Continuous Professional Training in a major Civil Service Department. Now I am retired, I am fortunate to have a pretty full diary and a wide range of interests. I’d suggest that all this gives me perspective in a world that shifts organically. The common thread in all my activities is a growing awareness of what makes people tick and an understanding of the hurdles and barriers that people face. My tutoring subjects are English Language and Literature. It occurs to me that writers, whether they are William Shakespeare, Grahame Greene or Carol Ann Duffy, try to make sense of the world in different intuitive ways, based on their own experience and applying their creative impulse and imagination. Since graduating (some time ago! ), I have continued my interest in literature, in particular through amateur drama. This confers a need to stand in others’ shoes: to get beneath the skin of characters’ psychological make-up. I believe that my diverse experiences over the years have helped in providing personal mentoring as well as subject tutoring. I have certainly enjoyed the challenge of revisiting texts and encountering new ones. Why tutoring has been a great experience! This year I have been working with Sehrish. She has been a delight to tutor as she is responsive and contributes ideas and thoughts of her own. Recently, she has had the wonderful news that she has been offered a place at Cambridge to study Law. As for me, tutoring for The Access Project quite simply gives me faith in the future, as it is a pleasure to work with such motivated young people and help them begin their own journeys. In summary, I hope that I have been able to distil some of the learning from my own experiences; to help students understand writers’ views of the world, the craft and techniques they employ to present their characters, reflections and times; and, above all, help enfranchise confidence and belief in themselves. Having had regular meetings with my tutor, Peter, for over a year now, I am confident in saying that our tutorials have benefitted my academic studies immensely. Despite going into A Levels with strong GCSE results, I quickly recognised the greater challenges involved with taking English Literature; having a much larger workload and adjusting to the new demands of a brand-new specification was something I required guidance on. 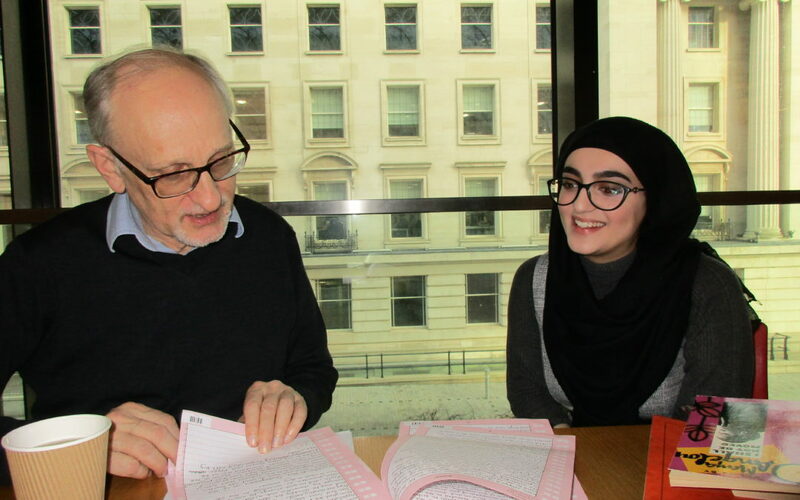 My tutor has supported me through the process, providing advice, revision techniques and resources that have accelerated my learning. In addition, the one-to-one tutorial style is beneficial as the session is centralised around my individual needs. Therefore, during tutorials Peter and I are able to highlight my weaknesses, and work on them together. This has subsequently refined the skills required of me to excel in A Level English Literature. My tutor is someone who is extremely well-informed and insightful; Peter is able to spontaneously provide me with information that I know I would not obtain in a normal classroom environment. This extra depth of knowledge reflects positively in my grades. Overall, I am pleased that I have had the opportunity to be part of the Access Project, and I recognise the many opportunities that have arisen as a result of having a tutor, such as Peter. If you’re curious to find out more please get in touch!